A hundred years is a long time. I mean, I wouldn’t really know. I haven’t been alive long enough. Neither has my father. Or my grandfather. But Hellmann’s is about to celebrate 100 years of business, and when they asked me to help them celebrate, I couldn’t say no. Firstly, like I said, 100 years is super cool. Also, I use one brand of mayonnaise and one brand only. Obviously, that’s Hellmann’s. And lastly, they are partnering up with Mario Batali, who I am a teensy bit obsessed with, (like, if one chef would cook me a kosher meal, I would probably pick him) to celebrate this milestone. In honor of their big 100, Mario Batali recreated a number of Hellmann’s classic recipes. They asked me to put my own spin on one of Mario’s recipes. Well, there were a number of yummy looking options, but when I saw the chocolate cake, I immediately knew I had to create it. Firstly, I have long been intrigued by the concept of putting mayonnaise in sweet dishes. Also, chocolate. Anyway, you know how I love mini’s, so I had to miniaturize this recipe! Instead of a layer cake, I made cupcakes. And while Mario Batali says he likes this topped with whipped cream, I couldn’t help myself. 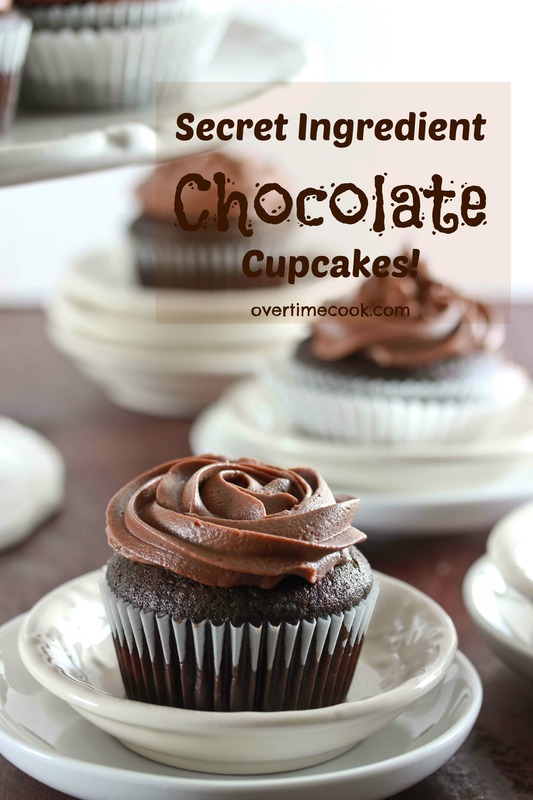 I had to dollop on some of this magical Chocolate Sour Cream Frosting. The only other change I made was swapping out the water for coffee. Because, uh, coffee. Anyway, the result? Moist, chocolaty, deliciousness. 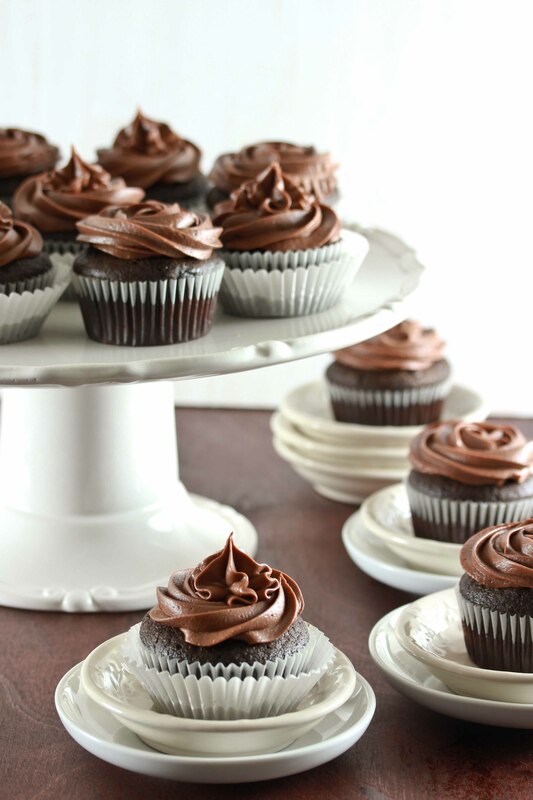 The mayonnaise gives these cupcakes a fabulous and rich texture! Before we get to the recipe, I want to let you know that Hellmann’s is offering all of you a chance to put your own spin on one of Mario Batali’s recipes…and win! Click here for all the details! Preheat oven to 350. Line a cupcake pan with paper liners. If using all purpose flour: whisk together the flour and corn starch, then sift into a bowl. Combine the flour, baking soda, salt, cocoa powder and sugar in the bowl of an electric mixer. Stir to combine. Add the Hellmann’s mayo, eggs, coffee and vanilla extract. Beat until combined and not lumpy. Spoon the batter into the prepared cupcake liners, filling them 2/3rds full. Bake at 350 for 18 minutes. Remove and set aside to cool. Melt the chocolate over a double boiler until smooth. Add the butter/margarine and melt. Remove from heat and set aside to cool for 5 minutes. Stir in the sour cream until smooth. Add the chocolate mixer into the bowl of an electric mixer and beat in the powdered sugar. Spoon or pipe the frosting over the cooled cupcakes. Disclaimer: I was compensated by Hellmann’s for this post. However, all opinions and pictures are my own. They look great! But I don’t know… mayo? Mayonnaise is just eggs. Probably makes these little cakes extra moist. I’m going to try! How many cupcakes do you get from one batch? When you write 1 3/4 cups coffee – how much coffee to how much water did you use? Just make coffee as you normally would to drink it. Either brewed or instant. can i use a different brand mayo? what can i substitute the sour cream with? Probably better off using a different frosting recipe. You can use Tofutti sour cream though. These look delicious! Your photos are absolutely spectacular. Have you tried using this batter to make cake? If so what would the baking time be and what size pan would you use. Thank you. LOVE your blog! I haven’t but that’s how the original recipe was! Click the link above the recipe to get the original version. I haven’t made chocolate cake with mayonnaise before. I can just imagine how moist they would be. These look fantastic, Miriam, especially with that gorgeous frosting on top. What an interesting recipe! Sounds great. Love the photos too! If I don’t have corn starch and I only have All Pupose flour, will that work ok, or is there something else I can substitute for the corn starch? Not sure, sorry. Plain AP flour isn’t a good sub for cake flour though! I ended up using potato starch instead of corn starch and it worked very well but I am definitely going to buy cake flour. The cake was delicious! the coffee measurement just 1 3/4 ground coffee or that’s coffee with water included? 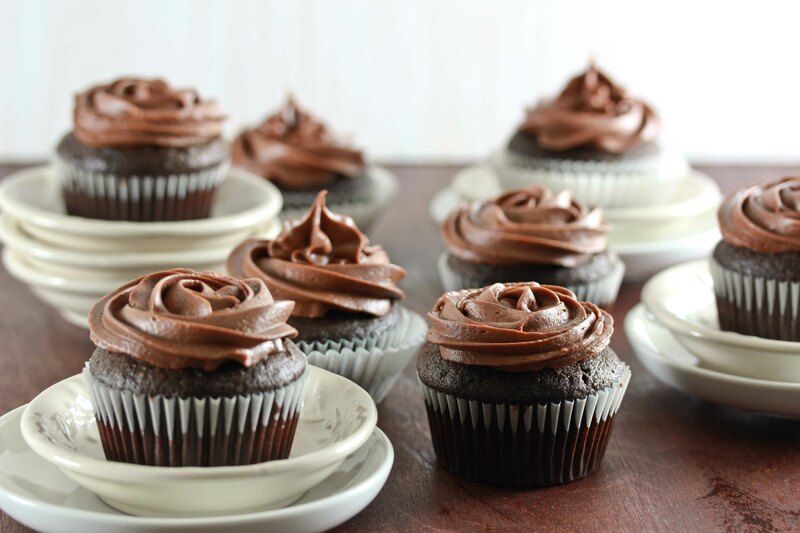 These cupcakes look SO decadent, oh my gosh. In love. I’ve read about using mayo in chocolate cake, and this just proves that I need to try it. Stunning pictures, gorgeous cupcakes. I’ve heard of mayonnaise in cake batter but have never tried it. the cupcakes look great! Gorgeous cupcakes! I’m totally intrigued by the mayonnaise in them. And I 100% support you adding that Chocolate Sour Cream Frosting… I mean…whipped cream… orrrr chocolate frosting… is that even a question?? this cupcakes look delicious!! I’m just wondering how the frosting would taste…is it very sour? ?